The 40th annual FIA International Futures Industry Conference in Boca Raton has come and gone. And it being my first FIA Boca, I thought I’d share some of the highlights from my experience. The week was filled with interesting speakers and discussions on the relevant futures industry issues. Regulation, risk, globalization and the evolving FCM business models were hot topics across the panels and on the minds of the industry leadership. I personally enjoyed the Global Exchange Leader panel. This was hosted by Bloomberg TV’s Betty Liu. What a great opportunity to see all the CEOs of the major global exchange operators together on stage. 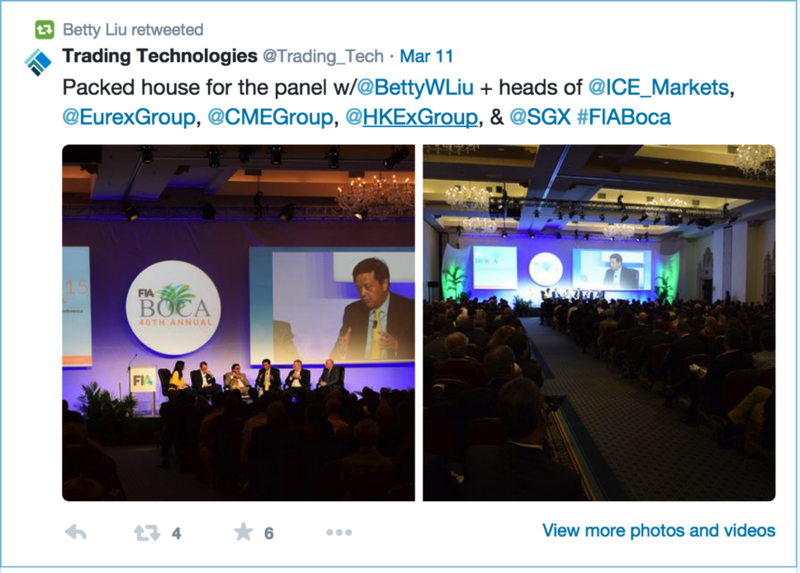 @Trading_Tech even got a retweet from Betty on one of our posts! Blu Putnam, the CME’s Chief Economist, gave his outlook for 2015 by providing reflections and trends across the range of markets. It was like going back to college and attending econ class–very thought-provoking…but with very few answers. And the hits keep on coming. Amazon Web Services posted a blog about TT and that is now being picked up by the Silicon Valley tech media. We will continue to share the enthusiastic media coverage of the new TT platform and our innovation over the next several weeks. My last thought on FIA Boca was that the futures industry is packed with passionate, dedicated and genuine people. The connections, relationships and insights shared during the busy week in Florida was fulfilling on many levels. And it was a very successful week for TT at Boca because of the meaningful customer meetings, media interviews and relationship building. But that was only possible because of the many years of hard work from the passionate, dedicated and genuine people of TT.